Ask us how you can create over a million colors! 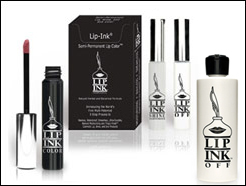 LIP INK® Cosmetics employ a patented 3 product ECO system. Water/Off Oil/lip moisturizer Botanicals/Guaranteed smearproof color. 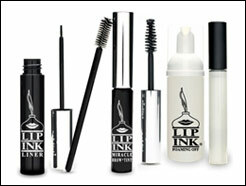 LIP-INK products are: Vegan, Kosher, Natural and Organic. 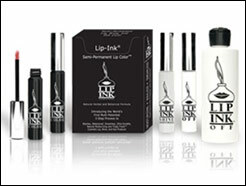 LIP-INK products are: Waxfree with No Glycols or Parabens! 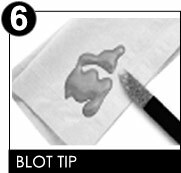 Blot the tip of your applicator on a tissue or dark cloth. Use ASESIOD (A Smooth Even Stroke In One Direction). This insures that your color goes on even Up to three layers. FEEL THE TINGLE This is the herbs, mints and botanicals. 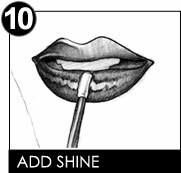 Finish with a layer of Lip Shine Moisturizer if desired. 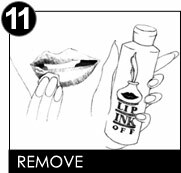 Remove LIP-INK by applying the OFF solution to a cotton ball, make-up pad or a warm, lightly moistened, dark colored wash cloth. 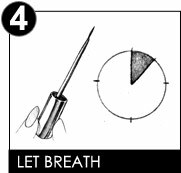 Press to the lips allowing a few seconds for the OFF solution to break down the pigment. 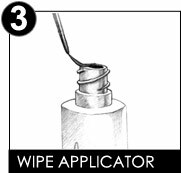 Gently dab the lips (never scrub) to wipe away the finish, flipping the pad, or cloth as you do so. 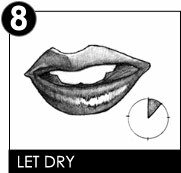 After color is removed, splash lips with water and pat dry. 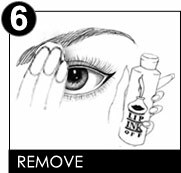 Shake the vial of LIP-INK EYE LINER against the palm of your hand until the beads move freely. 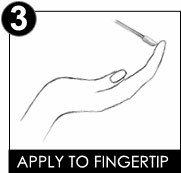 Carefully remove the applicator, and wipe the excess into the vial. 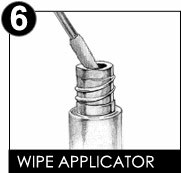 Allow 10 seconds for the applicator to breathe. This is important or tearing may occur. 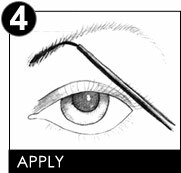 Carefully apply color around the OUTSIDE of the lash line. 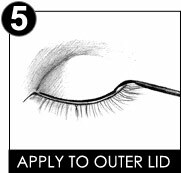 DO NOT apply to the inner lids. 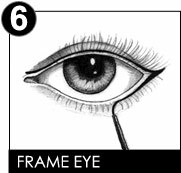 Avoid contact with the eye itself. If irritation occurs, immediately flush with water. Remove LIP-INK by applying the To remove LIP-INK EYELINER, saturate a make-up pad, a cotton ball or a warm. moist, dark colored washcloth with the LIP-INK OFF solution. 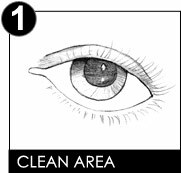 Press to the eye area for a few seconds then gently wipe (never scrub) to remove the finish. Splash with water and pat, dry. 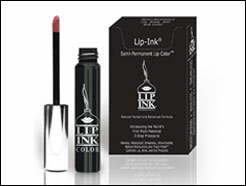 LIP-INK EYELINER is formulated for the sensitive area around the eye. 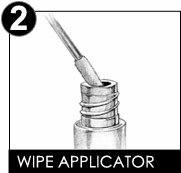 We DO NOT recommend using the LIP-INK MIRACLE BROW LINERS or LIP-INK LIP LINER as eye liner. Lip-Ink MAGIC POWDER'S can be used on the lips or eyes. Lip-Ink MAGIC POWDER Mineral powers are ground to a extremity fine micro particle size, to be used synergistically with other Lip Ink color products utilizing our patented layering process by layering our powders in between layers of guaranteed smearproof color or Lip Ink Clear. Lip-Ink MAGIC POWDER Mineral powers are completely free of preservatives. Gently press the MAGIC POWDER over the second layer of LIP-INK COLOR, then apply the third layer of color, and finish with a coat of SHINE. Apply the MAGIC POWDER on top of the base coat of SHINE. Proceed with the normal LIP-INK COLOR application. 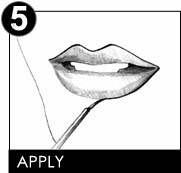 Apply three layers of LIP-INK COLOR, and then gently press MAGIC POWDER on top. A layer of LIP-INK CLEAR must be applied over the MAGIC POWDERS , to "lock" them in place when used in this manner. A coat of SHINE may then be applied. Shake the vial of Lip-Ink Lash Tint against the palm of your hand. Open slowly, it can splatter. 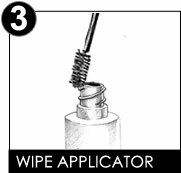 Remove the mascara type applicator brush, and paint the Lash hairs. 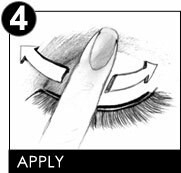 Apply Lip-Ink Lash Tint to the individual lash hairs, with the natural growth of hair. 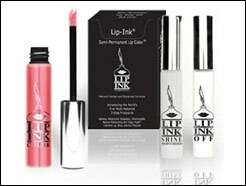 Lip-Ink Lash Tint will cover hairs lightened by the sun and gray hairs. Color all the way into the existing lash line. 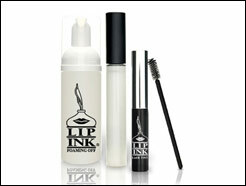 Lip-Ink Lash Tint products dry in approximately 30 seconds. 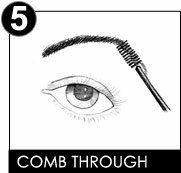 Be sure not to apply more than 3 layers to the lash hairs. 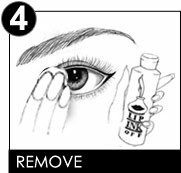 To remove Lip-Ink Lash Tint , saturate a make-up pad, a cotton ball or a warm. moist, dark colored washcloth with the LIP-INK OFF solution. 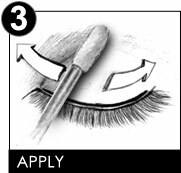 Press to the lash area for a few seconds then gently wipe (never scrub) to remove the finish. Splash with water and pat, dry. 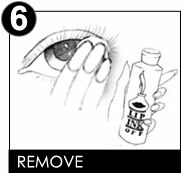 Make sure the brow area is clean and free of oils, creams and lotions using LIP-INK Off Conditioning Remover then splash with water and pat dry. 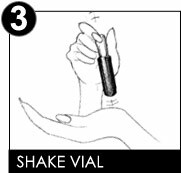 Shake the vial of LIP-INK MIRACLE BROW TINT against the palm of your hand until the beads move freely. Apply Miracle Brow Tint to the individual brow hairs, with the natural growth of hair. Miracle Brow Tint will cover hairs lightened by the sun and gray hairs. Color into the existing brow line. If you find that you need more brow hairs. We highly recommend our LIP-INK Miracle Brow Liner. Comb through with the brush provided to separate and groom the hairs once they are tinted. Color into the existing brow line. LIP-INK Eye and Miracle Brow products dry in approximately 30 seconds. 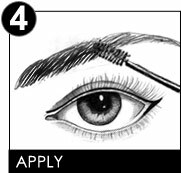 Be sure not to apply more than 3 layers to the brow hairs. LIP-INK Miracle Brow Tint is 24-7, (wear to bed) color. 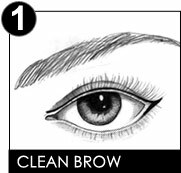 To remove MIRACLE BROW TINT, saturate a make-up pad, a cotton ball or a warm. moist, dark colored washcloth with the LIP-INK OFF solution. 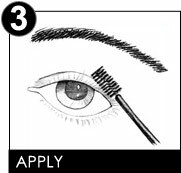 Press to the brow area for a few seconds then gently wipe (never scrub) to remove the finish. Splash with water and pat, dry. 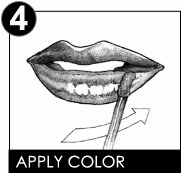 Before application, use the LIP-INK loose mineral powders to blend your own personal color. A clear spatula and white capped jar has been provided for this purpose. 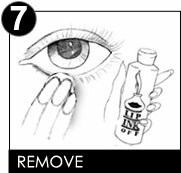 Purify the area of the skin you wish to cover with LIP-INK OFF SOLUTION. Then splash with water and pat dry. 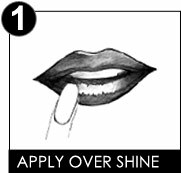 Apply one layer of LIP-INK COLOR CLEAR, in one direction only, over the entire area you wish to cover. IMPORTANT: Apply mineral powder while LIP-INK COLOR CLEAR is still wet. Remove mineral powder with spatula and put it in the mineral powder jar cap. 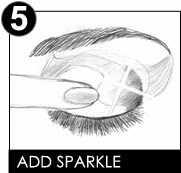 Take the sponge applicator and dip it into the loose mineral powder. 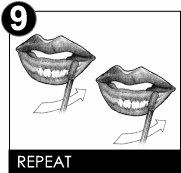 Tap it onto the area directly over the LIP-INK COLOR CLEAR area previously painted repeat steps 3 and 4 at least three times until you no longer see the tattoo, bruise or scar. Wipe off the excess powder. To remove your LIP-INK SEMI-PERMANENT 24- 7 INSTANT COVERUP, Use the OFF SOLUTION tear packet. apply and compress it to the desired area you wish to remove your COVERUP application. Finish by splashing with water and pat dry. 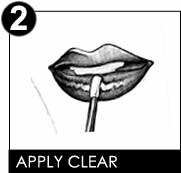 IMPORTANT REMINDER BEFORE USE: Upon first application of our classic LIP-INK Clear, open the vial carefully, as LIP-INK formulas are LIQUID. 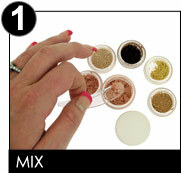 While opening LIP-INK Natural Mineral Powders are purposely filled low, they have no inside cover under the cap. This is by design so that you can shake them inside the jar before opening. Both can spill, or splatter when in contact with clothing, carpet, etc. Keep out of heat. Start by cleansing the area you wish to apply the blush too with the OFF solution, then splash with water and pat dry. Dab LIP INK® Blush and Bronzing Gel onto your finger and gently smooth onto your skin. Use over or under your favorite foundation. If applied to your lips or around your eye, be sure to apply to dry, clean skin. Start by cleansing the area you wish to apply the tint with the OFF solution, then splash with water and pat dry. Next you may follow one of the directions for desired areas below. You must apply onto clean dry skin or lips for maximum results. You can layer the Translucent Tint with any LIP INK® Liquid LipStick or LIP INK® Lip Moisturizer. To apply, first use the applicator ball to apply the tint to the eyelid. Then use the Cosmetic Makeup Sponge to blend your color tint. Tingly Fresh with Maximum Hydration & Sun Protection Lip-Ink Kit Collections Lip Ink International self manufactures the worlds only award winning multi Patented pure natural herbal Wax Free Semi-Permanent Cosmetics on the market today. GUARANTEED SMEARPROOF or your Money Back! We at Lip Ink are so confident about our promise that if you find that your lip color smears we will give you your money back! Long Lasting is simply long lasting- nothing more than that! It means that the lip product is going to last a long time, with no guarantees and no promises to back it up. Long lasting lipsticks usually have descriptive words like touch proof, budge proof, kiss proof, transfer resistant representing long lasting. Semi-permanent on the other hand is in a world of its own. Created specifically by Lip-Ink International. Semi-permanent, by definition: means that the product is not only long lasting, it is virtually impossible to smear. It is 100% smearproof. You can wear it to bed, shower in it, kiss your children or significant other, and eat an oily meal with drinks with confidence that your lipstick is not going to come off. Note: If you find that your lip color is smearing, you are not applying product properly. We would need to test the product to determine if it is in fact smearing.